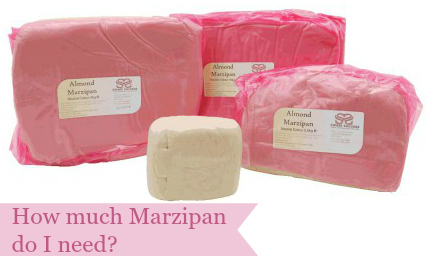 How much Marzipan do I need? All fruit cakes need to be covered in marzipan, before being coated in Royal Icing or sugarpaste. You can also use marzipan for modelling, moulding and as an ingredient in various recipes. Sweet Success almond marzipan is a smooth, neutral coloured paste with a delicate almond flavour, picked specially to complement our fruit cake. It is made from a blend of Californian sweet almonds and Mediterranean bitter almonds, with no added colourings. 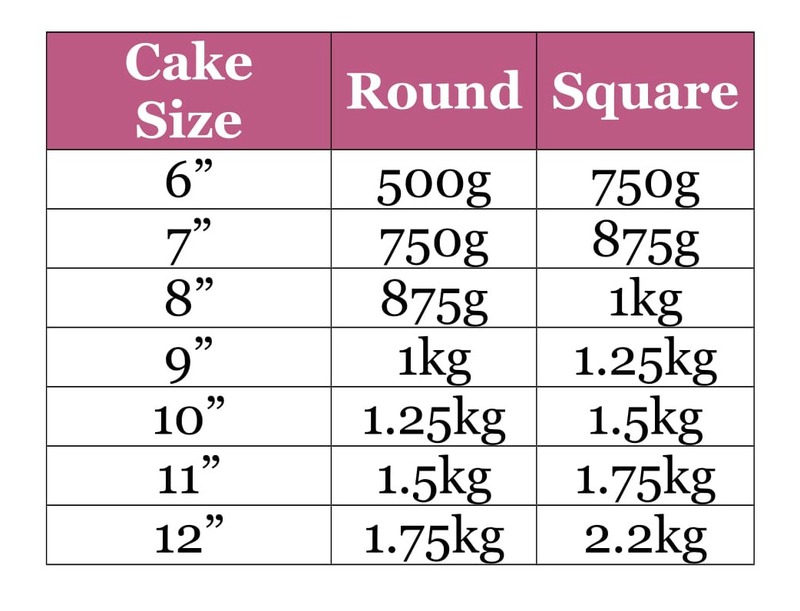 The table below gives a guide to the quantity of marzipan and sugarpaste you will need for various shapes and sizes of cake. NB only one weight is given for each size of cake - you will need this weight of sugarpaste AND of marzipan if using both. As a general guide, we allow 15g each of sugarpaste and marzipan per square inch of cake. Using the quantities below should cover the cake to a depth of approx 5mm - the exact weight you use will depend on how thinly you roll the paste. Why not try these handy marzipan and sugarpaste spacers to help you get the ideal depth for your covering? Don't forget you will need to allow more sugarapaste if covering the board - the exact quantity will depend on your method of covering. For a Royal Iced cake, the amount of marzipan will be half the weight of the fruit cake base. Marzipan Ingredients: Sugar, Almonds (25%), Glucose Syrup, Water, Sorbitol Syrup, Invert Sugar Syrup, Salt, Preservative E202.